On June 21st, the Friend of the Medallion hosted an event at the Aubrey K. McClendon Whitewater Center at the downtown Riversport Adventure Park. The event speakers talked about the past, present, and future of the OKC MAPS projects. Highlighting the event was keynote speaker Ron Norick, former Oklahoma City mayor and visionary of the MAPS program. Mayor Norick provided insightful background on the history of MAPS including the precipitous event that kicked it off; the failure to land a contract with United Airlines maintenance in Oklahoma City. He spoke on how he and the planning team recovered from this disappointment and held their vision strong. Tom McDaniel, chairman of the MAPS 3 Citizens Advisory Board, told of the implementation and planning to get MAPS to where it is today. In addition to the well-known MAPS 3 projects such as the Convention Center, Scissortail Park and Streetcar, the project also have opened 2 new Senior Health and Wellness Centers with an additional 2 planned to open by 2021. Mike Knopp concluded the event detailing the origins of the Riversport renovation from dirty old ditch to Olympic training mecca for riversport events. It is now a world-class training facility for both whitewater and flatwater activities which also includs lighting for night-time training and television broadcast! 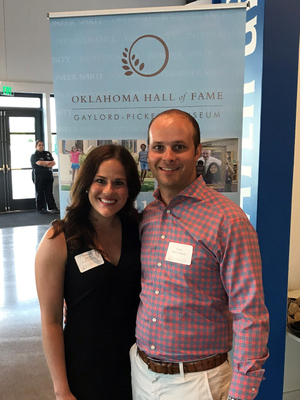 It was an enjoyable event for all in attendance, including several Oklahoma HOF recipients. To learn more about becoming a Friend of the Medallion, click HERE!